We are a family oriented practice. Dr. Rashid and Dr. Al -Attar provide services for children as early as new born. We have a play area, TV, kid shows and lots of rewards. When and How to clean baby’s teeth? Baby’s gum need to be cleaned (even if no teeth are present). Get a clean wet soft cloth (or gauze) and wrap it around your finger, seat the baby in a safe place, wipe the gum gently from back to front to remove milk. Once the first tooth starts to appear, a soft small tooth brush (with water) can be used. - It is recommended that a child sees a dentist when the first tooth starts to erupt or by the age of 6 months (whichever comes first). - Establishing a positive relationship with the dentist and staff at early age helps in creating a positive experience for the child, reduce the risk of having dental phobia and helps educating the child about the value of oral health. - Lower the risk of early childhood tooth decay or ECC. 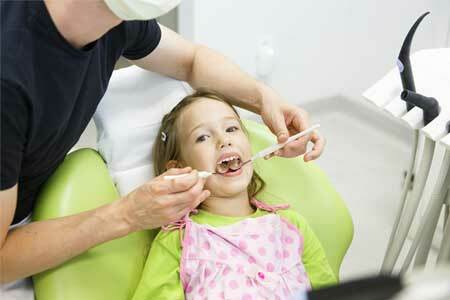 It is easy to get tooth decay in kids and carious usually progress rapidly. Identifying the problem early on and establishing a proper brushing technique and monitoring the feeding pattern can eliminate the need for extensive dental work (which may need sedation). -Contact MorningStar Dental to schedule your child’s dental visit. Let us know what is your child’s favorite toy, snacks and TV show, our staff will do their best to create a special happy experience for your little ones.